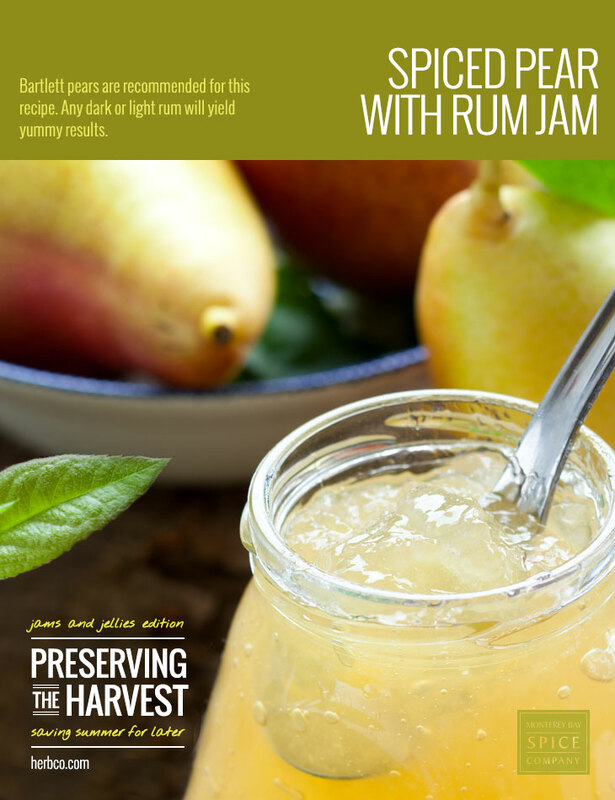 Bartlett pears are recommended for this recipe. Any dark or light rum will work fine, but Captain Morgan’s Silver Spiced Rum is especially good in this recipe. Prepare canner; sterilize 8 half-pint jars and lids. Place cardamom pods in a medium-sized muslin bag and crush lightly with a rolling pin or the back of a spoon. Add the allspice and cinnamon sticks to the bag. In a Dutch oven or large saucepan, combine the pears, sugar, and lemon juice. Add the bag of spices. Bring the mixture to a boil, stirring frequently, for 10-15 minutes, or until thickened. Remove from heat, remove the spice bag and skim off any foam, if necessary. Stir in rum and vanilla extract. Transfer the hot jam into canning jars, leaving 1/4 inch headspace. Stir with a chopstick or other utensil to remove air bubbles. Wipe rims, position lids and screw down rings until just fingertip tight. Process jars in a hot water bath for 10 minutes. Turn off heat and lift cans out with canning tongs. Set aside to cool on a counter or table for 8 hours or overnight. Check seals; refrigerate any unsealed jars and use within 2-3 weeks.